← ASQ Question of the Month: How Will The Future of Quality Unfold? It’s 6 Points on the L&D Compass. In my view. Your view may need to vary. 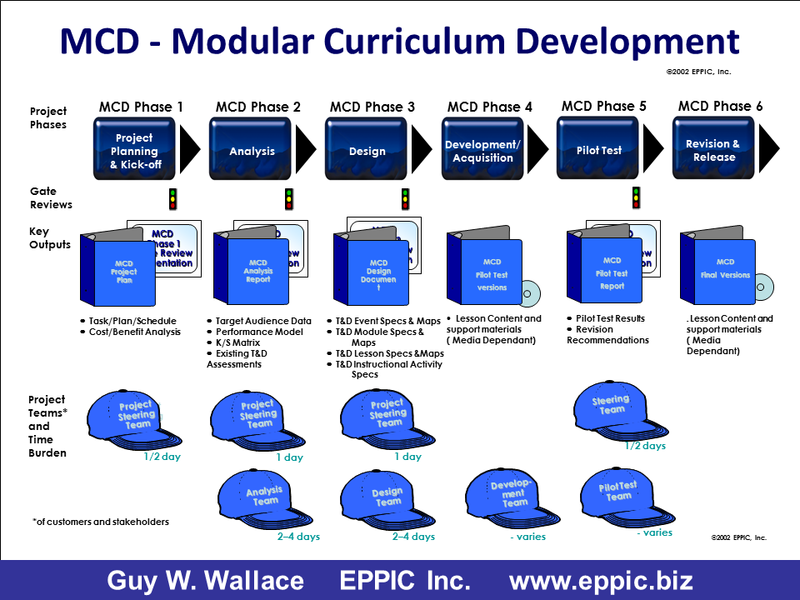 This is most critical – to eventual ROI – Level 4 Evaluation data – and Level 5 if you are into that model. Which requires good Level 3 and Level 2. All Learning starts as Informal. If that is sufficient – then let it be. If not, formalize it. But targeted for the probably returns in terms of revenue achieved and/or risks avoided. 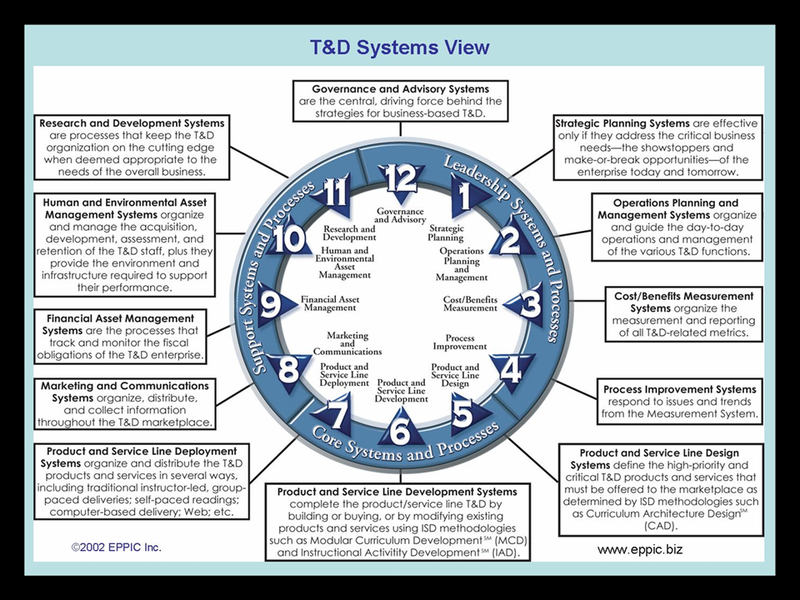 I recommend a more Formal than not – Governance & Advisory System – such as covered in my 2001 book: T&D Systems View – and at the top of the clock in this model. And … if the situation requires it – a more formal Governance Structure, Processes and set of Practices … putting the customers and other stakeholders in the driver’s seat … so to speak. Here is an example of a structure below. Your needs may differ. 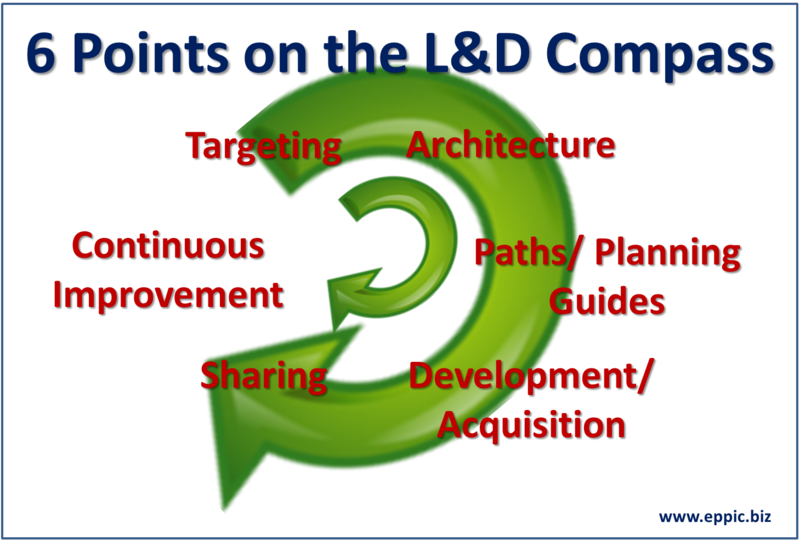 There’s more to L&D than ADDIE (or SAM, or SAT, etc.). Either your efforts are all one -offs … resulting in a set of overlapped (and gapped) content … and that THAT is acceptable … after becoming known. Or you are attempting to do better and treat the valuable content that you create as something other than a throw away – which is needed at times – but not all of the time. Architecture is dealing with an agreed upon taxonomy for all Enterprise Content. 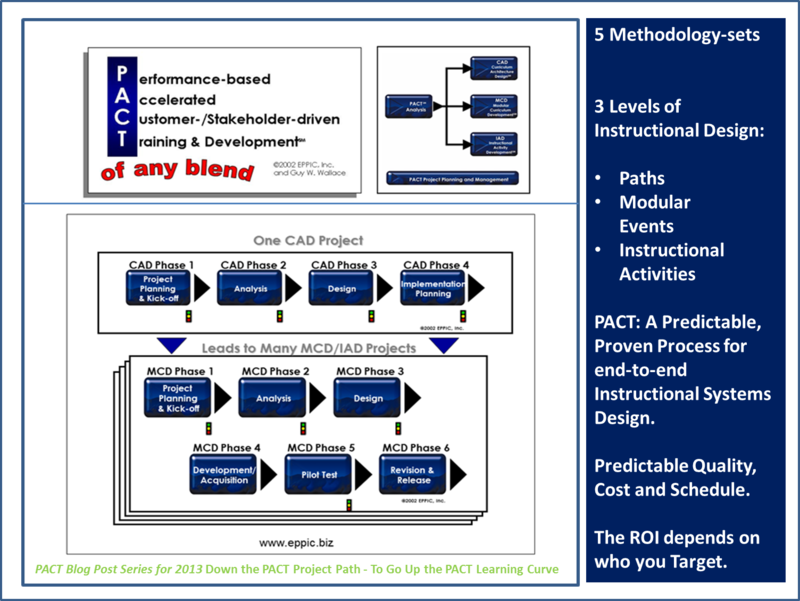 Here in the next graphic is one of 4 sets of content in the PACT methodologies. 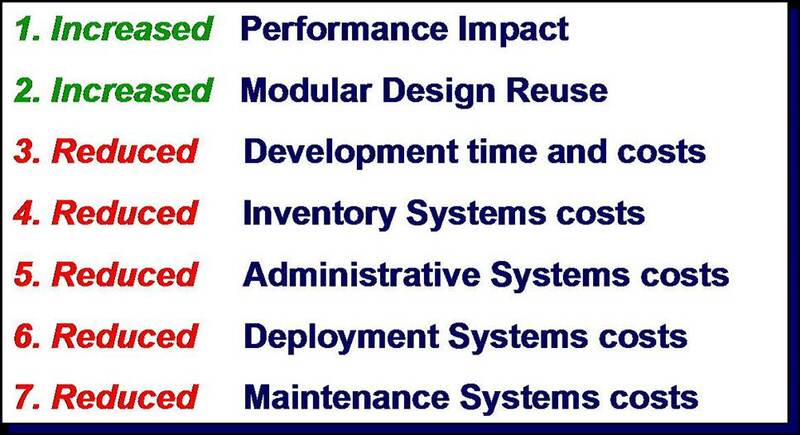 ReUse – for many purposes. Shared culture, shared language, shared understanding … etc. Providing guidance to Learners makes their Learning more efficient – and probably more effective as well. It’s beyond performance-based On-Boarding – to include On-Going development – of Performance Competence. And … Not Learning for the sake of Learning. Learning for the sake of the Enterprise. To enable the Performance Competence Requirements of critical Target Audiences. 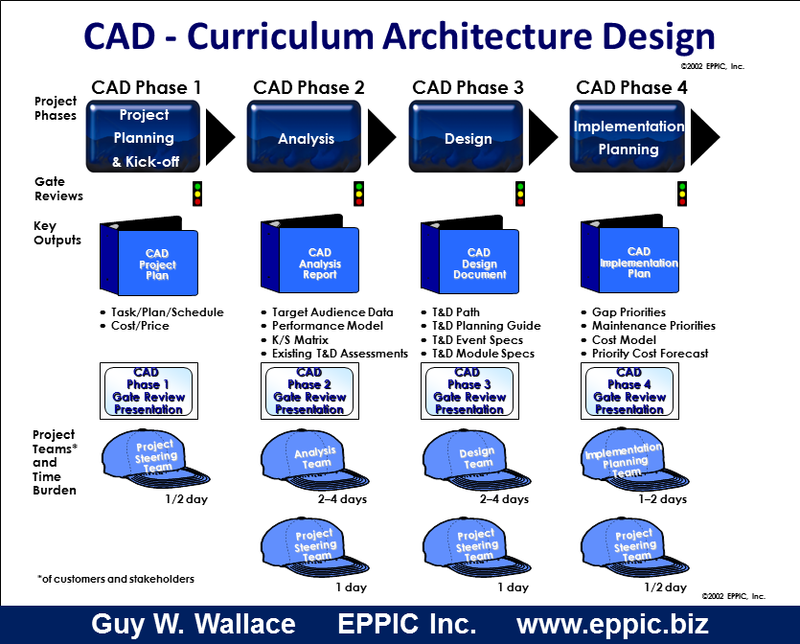 CAD efforts produce Paths and Planning Guides, reconcile existing content for ReUse potential, and identify all of the content gaps for prioritization and resources by the management of the Learners – to meet their business needs. Gaps left – are left to Informal Learning. By Design. Not By Chance. Sharing can happen with the front-end of the Path, an Event, or a Lesson (Module) within an Event, or at the Instructional Activity level, or lower at the text and image levels. 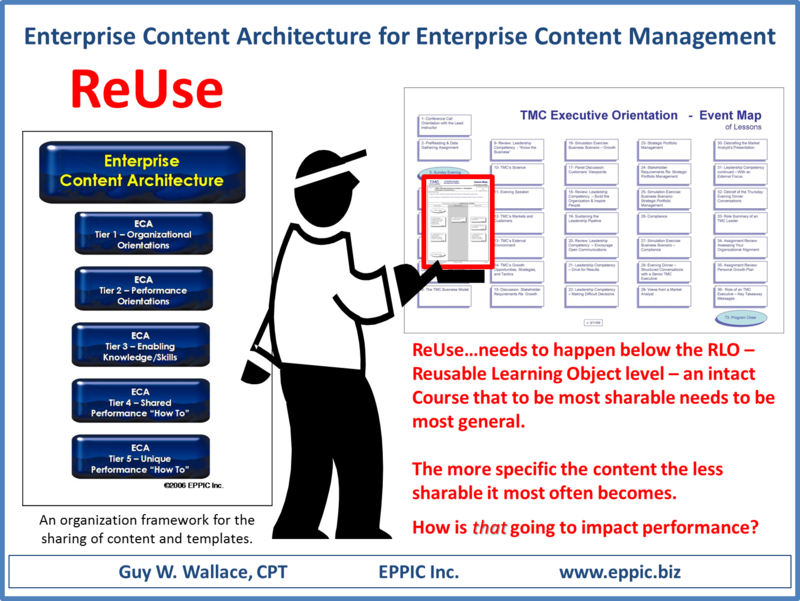 Or you can re-build, re-buy and otherwise be wasteful in your use of Enterprise resources to create Enterprise content. Build or Buy. And then use “as is” or “after modification” – and always inventory the derivative content. Not all projects require active involvement of a Project Steering Team. But that’s THEIR decision. Sharing can happen in many ways – controlled or uncontrolled – formal and informal. Sharing with PUSH Target Audiences – the critical target audiences – can happen with content shared as is – or after modification. Either built/bought for them as a Target Audience – or originally for another. That modified content needs to be stored both in inventory – and on the shelf – so to speak. To be available to others – for modifications or use as is. Putting a users group in charge of maintenance – via a Governance & Advisory structure of some kind – is best IMO. They’ll keep it up to date if it is worthwhile … and they’ll let die what should be. Pruning will be required of out-of-date content. Other content should be maintained in some controlled manner. Or why bother with build/buy in the first place (not that that can be reasonable even from an ROI perspective). But that’s a Stakeholder decision – not an ISD decision. And how formal your process needs to be – and what will be tolerated – will likely vary from other organizations. 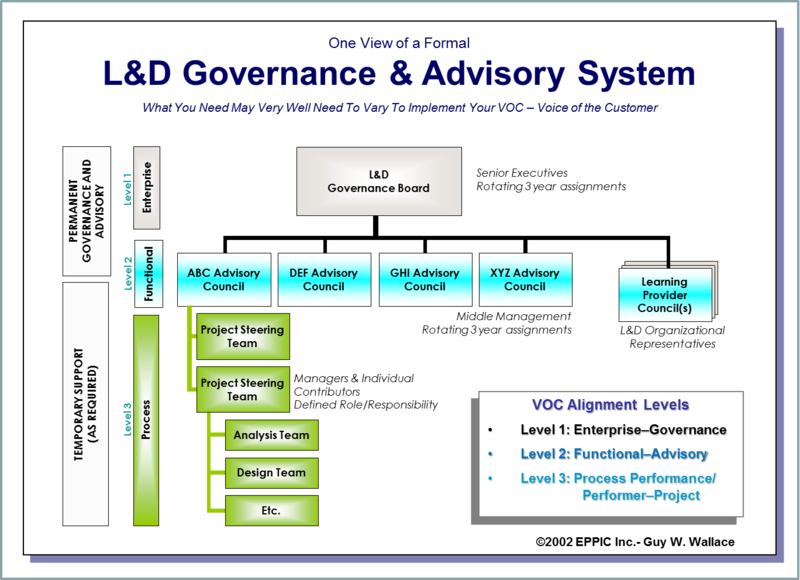 In the graphic above I would put “the call out for the need for CI” in the hands of the Advisory Councils – or whatever you might call them. And support them and their data/information needs in making those determinations. And I’m thinking Level 2 and 3 Evaluation data here. Is Your Content Organized or Disorganized? How do your processes contribute to – or inhibit – that organization? What Are the Returns for Addressing This? The first focus is Effectiveness – in impacting Performance Competence of the Learners. The second focus is on Efficiency of the processes in terms of cost and speed of getting Learners to become Performance Competent enough at various stage of anticipated capability growth. Here is one sub-set of the entire PACT Logic – which of course exists within an EPPI Logic. And Learning – is a subset of many other enablers. Which may be more important to address than formalizing the Learning possibilities. Just because you can – doesn’t mean you should. 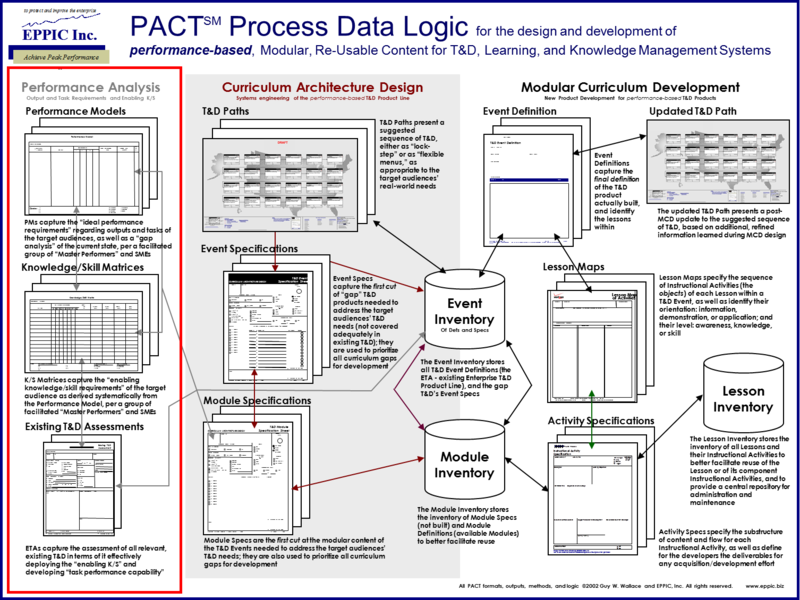 PACT – an ISD methodology-set – is a subset of EPPI – an Improvement methodology-set. 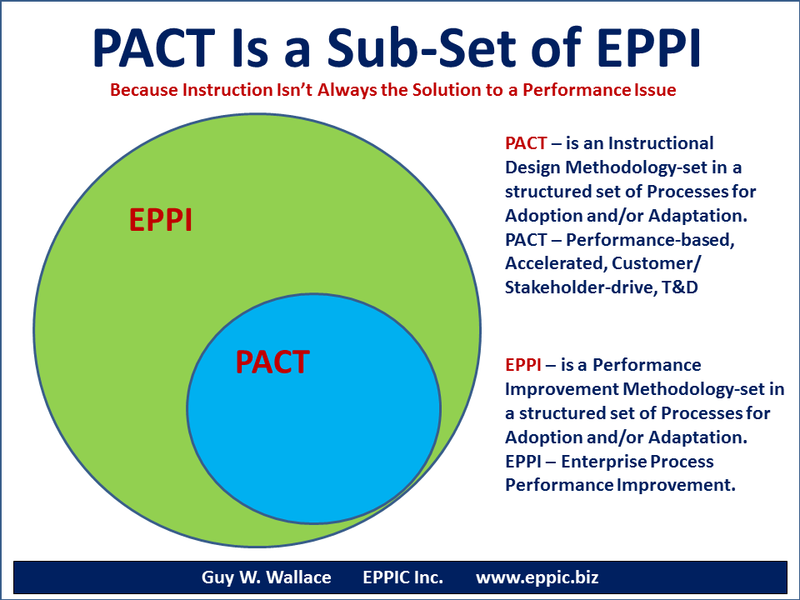 The structure, concepts, models, tools, techniques of PACT and EPPI are detailed enough and flexible enough for adoption and adaptation. Dozens of posts cover many of the above Points may be found elsewhere on this site. Please use the search function to probe further on any task or topic in the PACT and EPPI methodology-sets. It’s not about Learning … It’s about Performance.